There are a few days in June when you can finally declare "Spring is over": usually after a week of 90F heat, when your garden is wilting. This date does not come directly on the Solstice: it can fall early in June. For me it was this morning: my garden at home that had been magnificent for months suddenly looked wilty, the weeds were evident and abruptly, there was a lot more foliage than flowers. "Oh my Heavens!" said I (OK, I admit, I used a less lofty locution) it's summer. Rhymes with bummer! 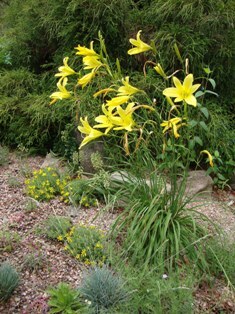 Summer means daylilies. You had better love 'em: after all, they love our gardens (provided they are sunny and not too dry). And all around Denver you now see splendid stands of Hemerocallis fulva in its orange fury blazing in the darndest places. If you visit the gardens of cutting edge daylily fans (I know of two in Denver who grow more than 3000 daylilies: count 'em! 3000!) the range and variety that has been bred into this group defies logic or belief. We have some stunning specimens in various gardens at DBG. You better come check them out. Above I show one of the early Daylilies: I actually had this one bloom in March one year a very long time ago in my home garden. 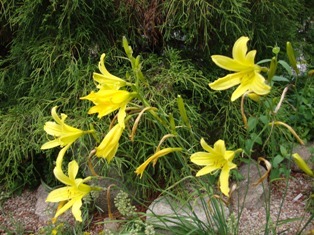 Some think it is a form of Hemerocallis minor. It is quite different from the H. minor we grow here at the Gardens. Whatever it is, it is beautiful like all its brethren, and has just helped launch the summer. I love simple, wild things. As much as I like spring, Summer does have its compensations, and Hemerocallis one very good reason to welcome the dog days of summer! Aawwwwooooooooooo!